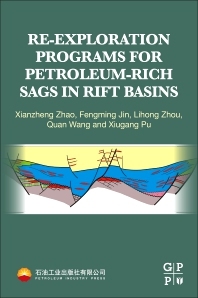 Re-exploration Programs for Petroleum-Rich Sags in Rift Basins covers the geological characteristics and potential of oil-rich depressions in a rifted basin. It describes up-to-date research and technology, detailing the current status of exploration. The overall aim of the book is to guide a new round of hydrocarbon exploration of petroleum-rich depressions, contributing to breakthroughs in re-exploration and a substantial increase in reserves. Chapters discuss the reservoir forming theory of oil-rich depressions, characters of hydrocarbon migration and accumulation in a weak structure slope, key elements of reservoir forming of deep buried hills and inner curtains, and more. Other topics covered include complex subtle reservoir recognition techniques, deep layer and buried hill high speed drill technology, recognition of buried hill reservoir and hydrocarbon, high efficiency enhanced oil recovery, and finally, methods of secondary exploration of oil-rich depressions and the development of a workflow to guide research and exploration. Xianzheng Zhao is President of PetroChina Dagang Oilfield Company, and a well-recognised expert designated by the Hebei Provincial Government. He is an adjunct professor at the China University of Petroleum in Beijing, China University of Petroleum in East China, and Yangtze University. He obtained his masters and PhD degrees from the China University of Petroleum in Beijing, and was awarded the title of Professorial Engineer in 2005. Zhao is a member of AAPG, SEG, SPE, the Geological Society of China, and is co-chair of the Petroleum System and Reservoir Panel of the Petroleum Committee of the Chinese Petroleum Society. He is deputy editor of China Petroleum Exploration, and on the editorial board of Petroleum Exploration and Development and Marine Oil and Gas Geology. He has published 15 monographs, and co-authored 131 papers. He has devoted himself to the study of oil and gas exploration and development in faulted depressions, weakly formed structural slopes, subtle buried hills and coal bed methane in continental rift basins. Fengming Jin, professor level senior engineer and state council special allowance expert, born in December 1964 in Jizhou City, Hebei Province, China. He graduated and obtained his bachelor of engineering degree from Changchun College of Geology in 1986, and graduated and obtained his doctor of engineering degree from Chengdu University of Technology in 2007. He has long been engaging in the comprehensive studies on petroleum geology and exploration practices for the Bohai Bay Basin, Erlian Basin in North China region. He had published more than 60 papers, edited and published 5 books and had been awarded with 1 second prize of China National Award for Science and Technology Progress, 1 grand prize and 6 first prizes of China Provincial and Ministerial Award for Science and Technology Progress, and he is the winner of the 5th Huang Jiqing Young Award for Geological Science and Technology Progress. Lihong Zhou, professor level senior engineer, born in July 1968 in Gucheng County, Hebei Province, China, and graduated and obtained his M.Sc. degree from Changchun College of Geology in 1993 and graduated and obtained his Sc. D. degree from Chinese Academy of Sciences in 2005. He has long been engaging in oil and gas exploration and development and scientific research management work. He had been awarded 1 first prize of China National Award for Science and Technology Progress, 13 prizes of China Provincial and Ministerial Award for Science and Technology Progress, and had published 5 monographs and 74 papers, including 8 SCI papers and 9 EI papers; moreover, he had obtained 8 invention patent licenses in China. Quan Wang, male, born in July 1969 in Jizhou City, Hebei Province, China and obtained his B.Sc. degree from Northwest University in 1992 and a Ph.D. from China University of Geosciences (Beijing) in 2011. He was awarded with the title of professorial engineer in 2015. Quan Wang has been devoting himself to studies of both clastic and carbonate reservoirs in the Jizhong subbasin of Bohai Basin and Erlian Basin. He obtained 1 second prize of China National Award for Science and Technology Progress, 5 first prizes of Provincial and Ministerial Award for Science and Technology Progress. Furthermore, he published 8 scholarly monographs and 52 papers. Xiugang Pu, male, professor level senior engineer, born in December 1968 in Langzhong City, Sichuan Province, China and graduated as an undergraduate from Changchun College of Geology in 1990 and graduated and obtained his doctoral degree in Mineral Resource Prospecting and Exploration from China University of Mining and Technology (Beijing). He is the Director of the Oil and Gas Speciality Committee of the Geology Society of Tianjin City and the member of AAPG, SEG, Chinese Petroleum Society (CPS), Geological Society of China and Chinese Society for Mineralogy Petrology and Geochemistry and has long been engaging in the oil and gas exploration and geological study and management work on graben basins. Scientific research projects led by him had been awarded with 11 prizes of China Provincial and Ministerial Award for Science and Technology Progress. He had co-published 3 monographs and 1 collected papers and filed 17 invention patents; moreover, he had published more than 100 papers for special science and technology in core journals and national academic conferences in China, which had been included in EI/SCI for 16 times. He had been awarded with honor titles, such as the Excellent Scientific and Technical Worker of Tianjin City, Advanced Scientific and Technical Worker of CNPC etc.